We offer these young people the opportunity to have direct contact with France and the French and thus motivate them for their French studies in the school of their country. We offer these teenagers active and dynamic techniques to reinforce their knowledge of French, which is often passive. We always select our best teachers to offer a quality service to these students. It is now also possible to learn English under the same conditions. Premises : A large room is dedicated for watching films and to organize activities. A programme of activities organised every afternoon by qualified instructors and which includes two day trips on weekends. Airport transfers on arrival and departure from the residence, with an extra cost if the students arrive and depart on another day. This program is intended for students who have studied English or French for at least one year. Complete beginners are NOW accepted on certain dates and participants must be at least 10 years old and at most 16 years old. Classes are made of small groups of 15 students maximum with the same level of French. The teaching is based on practical activities and role-playing allowing everyone to participate actively in class and learn to speak French in a good atmosphere. 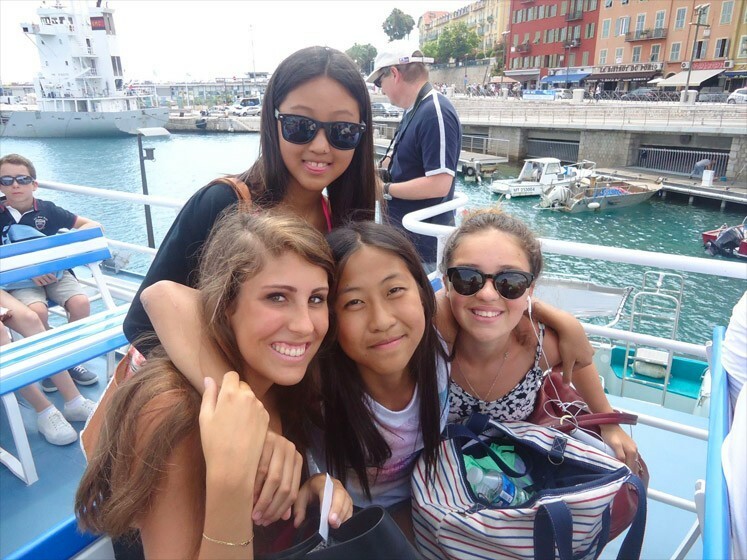 INTERNATIONAL HOUSE's teachers are specialized in teaching French or English to young foreigners and do their utmost to ensure that the pedagogy is well adapted to their audience. Courses start at 9 am and finish at 12:15 pm and take place from Monday to Friday except on public holidays. At the end of their stay, each participant will receive a certificate indicating their level of oral and written French. We maintain the reputation of INTERNATIONAL HOUSE schools by ensuring that our students receive a high quality education, tailored to their needs. Activities are organised every afternoon during the week with two day trips on weekends. During the week you will participate in beach activities: beach volleyball and supervised swimming. During the weekend you will visit the area with excursions to : Monaco, Antibes, Cannes, St Paul de Vence,Villefranche, and Eze. All of our group leaders have obtained a diploma recognized by the French Ministry of Youth and Sports to ensure that they have the skills required to take care of teenagers. You are safe 24 hours a day, under the supervision of the residence staff. Students over 13 will be allowed to go out until 10pm twice a week, and until 11pm over the week-ends, supervised by our group leaders, and with a written autorization from parents. Your room will be cleaned, and the sheets will be changed once a week. This programme complies with the rules imposed by the Ministry of Youth and Sports, which ensure a sufficient number of group leaders with the necessary qualifications to care for children. Our family programme allows parents and their children to study French in different schools, but with the same timetable during the summer months. This is a splendid way to enjoy a family holiday while improving your spoken French. You can stay in various type of accommodation including residences, studio apartments, host families and hotels. We have a new course for children from 4 to 10 years during the summer and school vacation. They will learn sports, music and dance in French. It takes place in a school which is a 5 minute walk from our main school at rue Rossini.